Beautifully heart-shaped, velvet-textured and vividly patterned with dramatic colors of deep green and metallic-grey blotches on top surfaces, and deep red beneath. 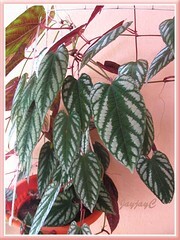 Rex Begonia Vine is definitely not a begonia though it does slightly resembles one. A magnificent ornamental vine, especially in a hanging basket with its beautiful foliage cascading or trained to climb on trellises, fences, etc. Our potted plant was espaliered against a wall with the support of a wired framework and it scaled 5 feet high to reach the ceiling and then turned horizontal to travel 8 feet across with its tendrils clasping whatever it touched. Such a vigorous tendril climber! 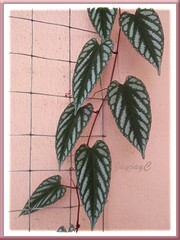 Plant type: Tropical perennial vine, native to South East Asia including Cambodia and Malaysia, and Java in Indonesia. Features: Cissus discolor is a fast-growing ornamental vine of the grapevine family, Vitaceae, in the genus Cissus which has about 350 species. Grown in containers, it is generally 3-5 feet tall but can reach 10-15 feet in height when left to climb unchecked. It is popularly grown for its extremely eye-catching foliage. 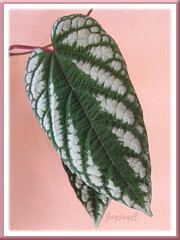 Velvety and coarsely textured leaves are elongated and heart-shaped, about 3-6 inches long and strikingly variegated. An explosive mix of dark green with silver-toned patterns and a central burgundy stripe decorate the top surfaces while the undersides are fabulously colored maroon, dark purple-red or burgundy. Adding to that beauty are the dark red tendrils that grow all along the burgundy-colored stem and clasp whatever they encounter, assisting the vine’s climb on fences, trellises, trees, etc. Culture (Care): An easy-to-grow vining plant that needs minimal attention, preferring a humid and wet tropical environment. Light: Medium light conditions or filtered sunlight for best growth, though tolerates low light or shade. Exposure to full sun may scorch its foliage. Moisture: Moderate water requirement. Allow the soil surface to dry out slightly between waterings. Provide adequate humidity by either misting the plant regularly or stand potted houseplant in a saucer of pebbles filled with water almost to the base of pot. Soil: Rich fertile soil that is well-drained and kept evenly moist. Others: Pinch out the growing tips to control shape and encourage bushiness. Should older plants become spindly and bare, cut them back drastically to between 5-8 inches to promote healthy growth. Feed once a month during the growing season with a general liquid houseplant fertilizer. Check for aphids, mealy bugs, whiteflies and spider mites that can attack the vine. Excessive sunlight can cause brown spots on the leaves and leaf loss. Even underwatering or overwatering will result in leaves wilting and falling. For temperate zones: Hardiness: USDA Zone 10 -11. Regarded as a tender perennial in non-tropical regions and not hardy to temperatures below 50 degrees F., so overwinter plant indoors, if affected. Propagation: Easily propagated from stem cuttings taken from healthy shoot tips about 3-4 inches long. Cut just below a leaf joint, remove basal leaves and pot them about an inch deep into moist soil. Usage: Makes a lovely hanging basket plant with stems gracefully cascading over the sides of the basket. Great as a potted plant that can be easily trained to climb on canes, or used as a vertical accent on trellises or arbors, fences and even trees. 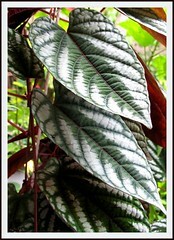 As it is tolerant of low light or shade, it can be grown as a houseplant too. Sorry, Donna… we’re not a garden nursery/center, just home gardeners. you have the seeds of begonia vine (Cissus discolor) and bulb of Ipomea batatas tricolor?